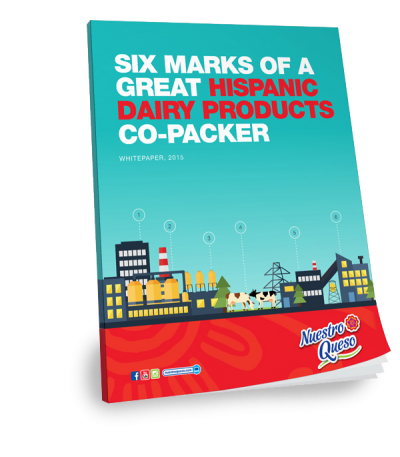 The opportunity for Hispanic dairy products in the US can be very attractive. These products not only appeal to Hispanic consumers but also to mainstream consumers who are positively influenced by the Latin style and tastes and are adopting Latino purchasing habits, beliefs and attitudes. But it is not easy to build and produce a Hispanic dairy brand products as it requires capital investment, Hispanic dairy specialization and manufacturing prowess. That’s where we come in… We produce the highest quality and most extensive line of Hispanic cheeses, sour creams and drinkable yogurts for top retailers and brands looking to capitalize on the Hispanic dairy growth opportunity. This is why we are Hispanic dairy co-packer of choice for top retailers and brands wanting to start or improve upon their own Hispanic dairy brands.